When grown in your garden, you’re able to witness this lovely Grapefruit tree changing its fruits from green to bright yellow as it ripens. That’s the best time to pluck your fruits as they are juicy and delicious, though acidic. Botanical Name: Citrus x paradisi. Common Names: Grapefruit, Paradise Citrus. Origin: Native from East Africa to tropical Asia, Papua New Guinea and the Pacific Islands. 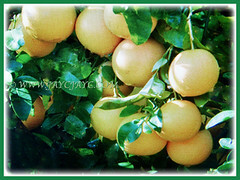 However, Citrus x paradisi is a hybrid between Citrus sinensis (Sweet orange) and Citrus maxima (Pomelo). It is also cultivated elsewhere around the globe. 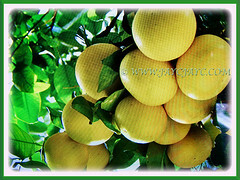 Features: Citrus x paradisi is from the genus Citrus that consists of 31 accepted species of trees. 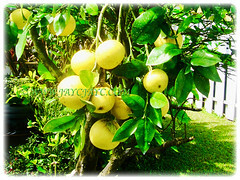 The woody, evergreen and perennial Grapefruit tree usually grows to around 4.5-6 m tall with age and has an equal spread. A moderate-growing tree with trunk 15 cm in diameter and can reach 13-15 m in height. It has a rounded top of spreading branches. The twigs usually bears short and supple thorns. The evergreen leaves are glossy dark green and ovate, measuring 7.5-15 cm long and 4.5-7.5 cm wide. They have minute rounded teeth on the margins and dotted with tiny oil glands. The petiole has broad and obviated wings. 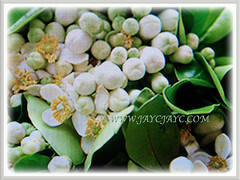 It produces small 4.5-5 cm across, white and four-petaled flowers that are highly fragranced. 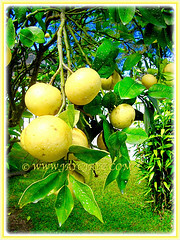 The flowers tend to be borne singly or in clusters in the leaf axils like grapes, hence the name Grapefruit. The fruit’s skin is yellow-orange in colour. Generally, round or oblate spheroid in shape. It ranges in diameter from 10-15 cm with smooth and finely dotted peel that is slightly bitter in taste. The centre may be solid or semi-hollow. The fruit’s flesh is segmented in 11-14 segments and acidic, varying in color depending on the cultivars, which include white, pink and red pulps of varying sweetness. Usually, the redder varieties are sweeter. 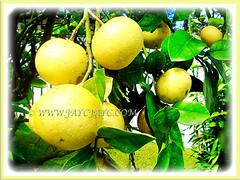 Culture (Care): Citrus x paradisi or Grapefruit can be grown easily with least maintenance. Light: Best in full sun for optimum growth and productive. It does tolerate partial shade. Soil: Humus-enriched, loamy and well-drained soils. However, it has adapted to a wide range of soil types. Others: No pruning is needed. Nevertheless, you can lightly prune back the branches to allow the foliar canopy to extend further to protect sensitive trunks from being scorched by the sun. It requires a regular fertiliser program consisting of a complete and balanced fertilizer containing micronutrients, especially zinc, iron and mangenese. Generally free from serious pests and diseases. Nevertheless, watch out for Caribbean and Mediterranean fruit flies, as well as Citrus greening which is a serious bacterial disease vectored by two psyllid insects. Do take note that Grapefruit and its juice have been found to interact with numerous drugs, resulting in adverse side effects. Citrus x paradisi or Grapefruit can tolerate temperatures that dip briefly into the low to mid -6 to -3°C. The grapefruit cultivar ‘Duncan’ has been known to grow successfully in zone 8b. It thrives well in a warm subtropical climate. Above 43°C, leaves will yellow and unpainted trunks will scald if exposed to direct sun. Water regularly during the hot seasons but less often during winter. Fertilise once annually in spring to enjoy the fruits in winter. 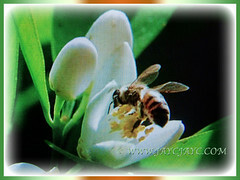 The flowers need honey bees for pollination and the nectar can be made into honey of superior quality. Propagation: Easily propagated by bud grafted onto rootstocks. It can be propagated from seeds but fruit production will begin between 4-5 years. Grafted trees may produce fruits within 2 years. Usage: Citrus x paradisi or Grapefruit produces juicy fruits that can be made into jam, marmalade, jelly, puddings and tarts. Grapefruit can be a breakfast fruit, chilled and cut in half, and sweetened with brown sugar or a bit of honey to reduce the acidic taste. 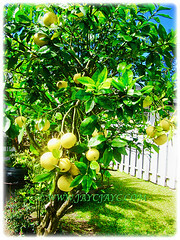 An ideal fruit bearing tree to be grown in your residential home to provide you edible fruits all year long. It is high in vitamin C, soluble fibre and lycopene. Consumption of grapefruits has been known to lower blood cholesterol levels, as a stomachic and cardiac tonic. The pulp is an effective aid to treat urinary disorders. Its seeds have antioxidant properties that helps the body’s metabolism to burn fat. 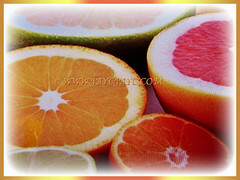 Oil extracted from the grapefruit peelings are used in aromatherapy. 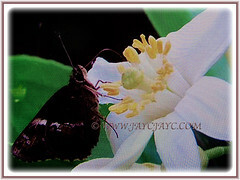 Besides, its a magnet for honey bees that are attracted by the highly scented flowers.